The London Olympics are the most Right-wing major event in Britain’s modern history. Billions of pounds are taken from poor and middle-income taxpayers and service users to build temples to a corporate and sporting elite. Democratic, grassroots sport is stripped of money to fund the most rarefied sport imaginable. Olympic Goodwill Image Belied by Arrests, Censorship and Corporate Ties Behind London GamesTuesday, July 31, 2012 While NBC has been airing wall-to-wall coverage of Olympic Games in London, little attention has been paid to what has taken place behind the scenes and just outside Olympic Park. The Government’s Draft Communications Data Bill was published in June marking the first step on a slippery slope towards blanket surveillance of the entire population. The Bill proposes to increase the collection and storage of “communications data” – records of email, text and phone calls – for the entire population. A detailed report launched on 24 July by the Network for Police Monitoring (Netpol) highlights how promises made by the police to ‘adapt to protest’ after 2009′s G20 demonstrations in London have been forgotten in a remarkably short space of time and a far more intolerant ‘total policing’ style response to protesters has developed in the UK. Les Levidow on challenging the travel restrictions in Palestine. A Conference hosted by the Network for Police Monitoring. Sunday 17th April. 10.30am – 5pm. In December 2010, the European Center for Constitutional and Human Rights (ECCHR) published a detailed critique of the terrorist blacklisting regimes operated by the United Nations and the European Union. Join us for a discussion and informal social gathering to celebrate the launch of four new briefing papers that highlight the impact of UK government anti-terrorism legislation on migrant communities here. In particular, bans on organisations make the UK government complicit with oppressive regimes overseas; this neither enhances human rights nor protects our security. The House of Commons will debate whether the controversial control order system will be renewed on Monday 1st March 2010. There are serious concerns about the renewal of control orders from all sections of our civil society. CAMPACC organised an open letter to the Home Secretary from over 120 individuals drawn from a range of professions and organisations urging him to not to pursue their renewal. CAMPACC's response to the Constitutional Reform and Governance Bill 2009 containing the repeal of the restrictions on protest around Parliament under s132-138 SOCPA. The submission to the Joint Committee on Human Rights gives details of concerns about alternative measures to be put in place. The first of two seminars on The Basque Country and Northern Ireland: Self-Determination, Proscription and Human Rights in the EU. The 'War on Terror' has seen intelligence agencies become major political players. 'Rendition', untrammelled surveillance, torture and detention without trial are now the norm. "Spies, Lies and the War on Terror" traces the transformation of intelligence from a law enforcement tool to a means of avoiding both national and international law. 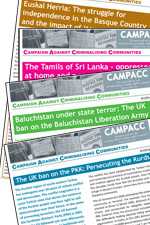 Read CAMPACC's statement and Mark Steel's article.